The new surveillance station will be capable of monitoring Chinese activities in the East China Sea. This Monday, the Japan Ground Self-Defense Force (JGSDF) switched on a permanent new radar station in Yonaguni Island, part of Okinawa Prefecture in the East China Sea. Yonaguni is located 150 kilometers (90 miles) south of the disputed Senkaku/Diaoyu islands and 100 kilometers (62 miles) east of Taiwan, The Japan Times reports. “Establishing a stable defense setup in the area of the Nansei Islands represents our country’s commitment to defense,” GSDF Lieutenant General Kiyoshi Ogawa said during a ceremony on Yonaguni Island. According to GSDF Lieutenant Colonel Daigo Shiomitsu, the commander of the unit now permanently based on Yonaguni, “Until yesterday, there was no coastal observation unit west of the main Okinawa island. It was a vacuum we needed to fill. We are required to quickly react to various situations. We hope to deal with them appropriately.” Around 160 GSDF personnel will be stationed on Japan’s westernmost inhabited island, which is home to about 1,500 civilians. The principal objective of the new permanent intelligence gathering post is to improve Japan’s air and maritime domain awareness around the Nansei (aka Ryukyu) island chain and to provide an early warning system in the event of conflict. Yonaguni Island is located near the edge of an air defense identification zone that China set up unilaterally in 2013. The new surveillance station will be capable of monitoring Chinese activities in the East China Sea and also able to intercept high-frequency communications in mainland China, Russia, North Korea, and the South China Sea. Japan currently operates some 18 major permanent listening posts throughout its territory. These radiowave interception facilities are capable of capturing very high frequency and ultra-high frequency bands at closer range and can intercept high frequency transmissions for up to 5,000 kilometers (3,106 miles) in all directions. Every listening post is integrated with Japan’s air and missile defense radar stations. “Together with Japan’s own long-range underwater surveillance systems, and combined with the Japan based U.S. parallel air, ground, and underwater surveillance systems, they take Japan a very long way towards its stated aim to ‘ensure information supremacy through continuous ISR [intelligence, surveillance and reconnaissance] in the country and its surrounding areas,’” according to a 2015 study by the Nautilus Institute. [T]he MOD the budget proposal has specifically allocated $90 million to purchase land and expand a Ground Self-Defense Force (GSDF) base to station a GSDF patrol unit on Miyakojima island in Okinawa Prefecture, and $72 million for construction of another base to house a GSDF patrol unit equipped with mobile surveillance radars on Amami Oshima island in Kagoshima Prefecture. Japan’s new observation network is part of an overall push toward fortifying Tokyo’s position in the East China Sea, in particular the Ryukyu Island chain, which stretches southwest from Kyushu to Taiwan. As part of this East China Sea strategy, the Japanese military also plans to set up its first Amphibious Rapid Deployment Brigade by the spring of 2017. The new unit’s primary mission will be to defend the 6,000 islands and islets of the Ryukyu Islands chain. 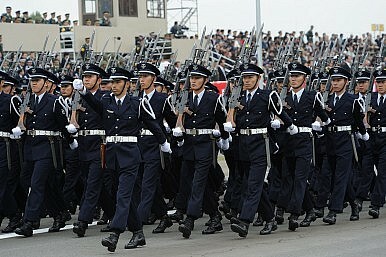 Overall, Japan’s military presence in the East China Sea is slated to increase to almost 10,000 personnel. Tokyo intends to deploy a new anti-ship missile to deter Chinese advances in the East China Sea.